A tuna sandwich with lettuce and tomato on a plate. 3 Can I Eat Sushi Twice a Week? 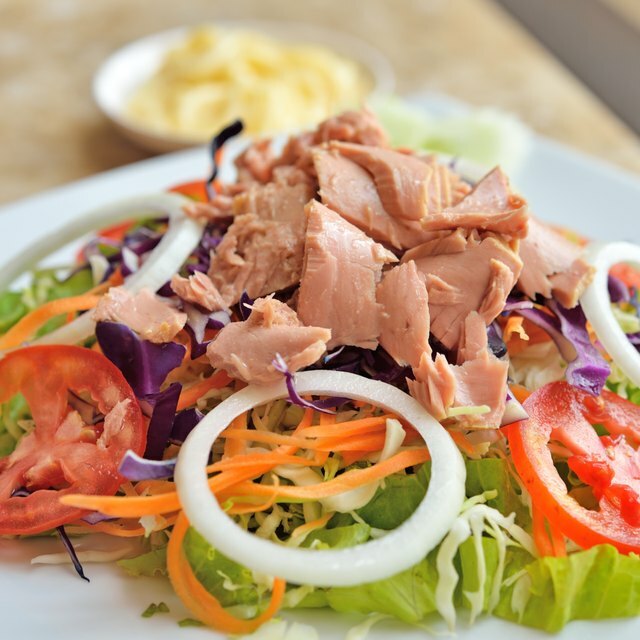 Canned tuna fish is a favorite food of dieters and those who love the convenience of canned foods for quick meals, but it carries some health considerations. Vitamin D and omega-3 fatty acids offer benefits, while mercury, sodium and cholesterol levels may pose threats. Depending on your physical condition, these variables may or may not affect your health. Your cooking, serving and eating habits play additional roles in how healthy tuna or any food is for you. The most widely accessible varieties of tuna in the can are yellowfin, bluefin and skipjack, or light tunas, and albacore, or white tuna. White tuna has slightly less protein and vitamin D and more total fat, mercury, sodium, cholesterol and omega-3s than comparably processed light tuna. According to the U.S. Department of Agriculture, the beneficial unsaturated omega-3 fatty acids EPA and DHA are associated with reduced risk for heart disease when 8 oz. or more of fish are consumed per week. Mercury levels in light tuna are considered safe for general consumption, while pregnant women and young children should limit white tuna to 6 oz. total or less per week. Tuna packed in oil gains calories over fish packed in water, but is still relatively low in calories per serving. Compare 3 ounces of light tuna packed in oil, at 168 calories, with light and white tuna packed in water, respectively, at 73 and 109 calories. If you have difficulty in controlling your weight, oil-packed tuna is less healthy for you, because its higher calorie content promotes weight gain. Water-packed tuna also carries more dietary cholesterol per serving, so if you have a heart condition, tuna canned in oil is the better choice. How much you eat will affect the nutrient ratio provided by your chosen type of tuna in the can. Diets to maintain weight should limit portions of fish to 3 ounces, and protein foods in general to 6 ounces total per day, according to American Heart Association recommendations. If you routinely eat more than that amount, you’ll take in additional calories along with more nutrients, which may lead to weight gain. 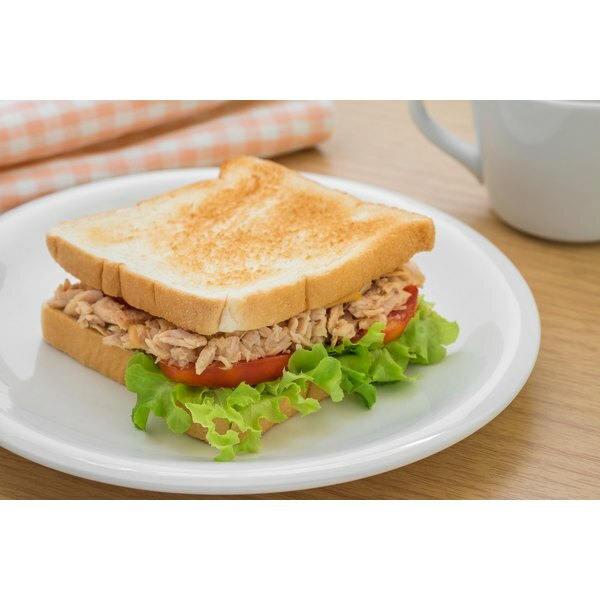 Canned tuna fish is typically eaten in sandwiches and salads and added to grain-based dishes. If you don’t add salt or fat to these preparations, tuna retains its generally healthy nutrient composition. Salt or salty ingredients, such as pickles, added to the already significant sodium content may increase your blood pressure. The saturated fat in butter and the cholesterol in mayonnaise make these two ingredients unhealthy additions to tuna fish dishes.